Explanation: How could such a long string of galaxies form so early in the universe? Several new measurements of galaxies and clusters in the early universe are reporting structures involving galaxies and clusters that are larger than expected with the new standard "dark-energy" cosmology. The controversy centers on the inability of a dark-energy dominated universe to create such large structures. Fans of the old standard cosmology -- without weird but pervasive dark energy -- are hoping that these new measurements rule out the newly popular strange universe. Previously, however, data taken from several independent sources over the past few years has only appeared to bolster the bold new universe paradigm. A compromise is still possible if the new data is not typical or if the comparison computer simulations are not properly biased. Pictured above is a computer-generated illustration of a universe that shows a string of galaxies of the size measured. 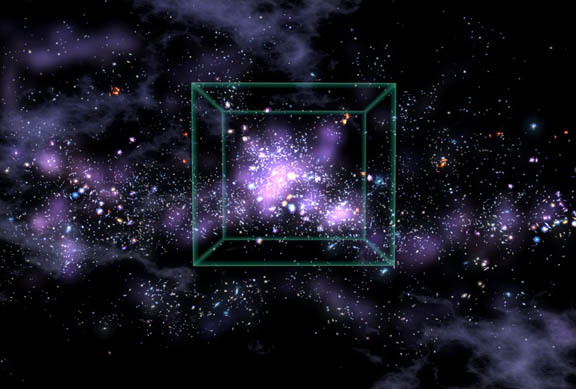 The size of the superimposed box is about 300 million light years on a side.